Russian gas holding Gazprom has announced that work is to begin on the construction of the Turkish Stream pipeline in June, despite the lack of an intergovernmental agreement with Turkey. Observers say the monopoly’s decision to launch a major export project without having signed binding contracts with the countries involved could lead to problems further down the line. 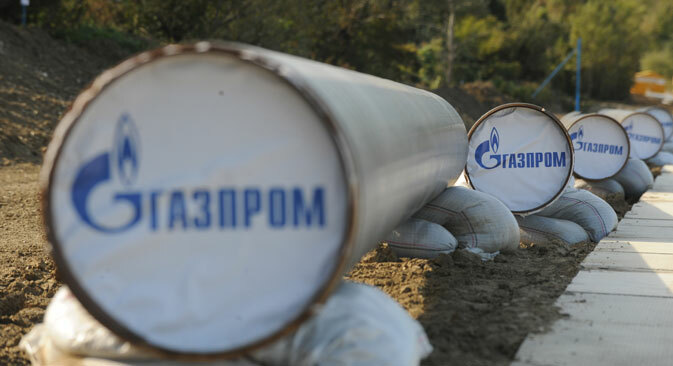 Russian gas giant Gazprom plans to start laying the Turkish Stream pipeline in early June, the company's board member Oleg Aksyutin announced on May 19. Two vessels will be involved in laying the pipeline under the Black Sea from Russia to Turkey. The first line of Turkish Stream is to be launched in late 2016; a total of four lines will be built, with a capacity of 63 billion cubic meters. The gas pipeline will run 410 miles (660 km) along the corridor originally projected for South Stream and 155 miles (250 km) along a new corridor toward the European part of Turkey. The first section of pipe will be laid by Italy's Saipem under the contract concluded for the construction of the now-defunct South Stream project, which was to have linked Russia with Central Europe via the Black Sea and the Balkans. Last week, Saipem said it had received instructions from Gazprom to proceed with construction. On May 19, Germany's pipe supplier Europipe said it would resume production for the Turkish Stream project. Despite giving a green light for the construction of the pipeline to commence, Russia has not yet signed intergovernmental agreements with Turkey and Greece, and is currently acting on the basis of old documents relating to the South Stream project. Gazprom contracted two pipe-laying vessels (the Castoro Sei and Saipem 7000) from Saipem to work on the marine portion of the Turkish Stream's precursor – the South Stream pipeline – since the fall of 2014, but stood idle after the abolition of the latter in December 2014. According to the calculations of the business daily Kommersant, this standby is costing Gazprom about 25 million euros per month. According to Sberbank CIB analyst Valery Nesterov, “the situation initially left Gazprom in a less favorable position, as it had to urgently seek a replacement for South Stream, to pay the forfeit penalties, to pay for the freight of ships and for the storage of pipes." The monopoly is in a hurry to bring gas to Turkey and Southeastern Europe before the EU can implement its counter-strategy for the supply of Turkmen and Iranian gas. As long as the construction does not affect the territorial waters of another country, an intergovernmental agreement is not required, says the head of the Moscow office of Debevoise & Plimpton, Dmitry Nikiforov, meaning that Russia has a certain amount of breathing space while construction proceeds in its territorial waters. The Dutch subsidiary of Gazprom, South Stream Transport B.V., has permission to lay about two-thirds of the offshore section, which is due to be located in the territorial waters and the exclusive economic zone of the Russian Federation (the permits were obtained for South Stream). In the worst-case scenario, writes Russian business daily Kommersant, citing a source close to Gazprom, such haste may lead to a situation in which Gazprom will be forced to suspend the construction of the pipeline while the undersea sections are still being laid, pending a decision from Turkey. According to the source, this would be technically possible. However, Gazprom expects to reach an agreement with Turkey in the near future. According to Kommersant sources in Russia who are familiar with details of the negotiations, the delay is connected with the parliamentary elections in Turkey, to be held on June 7. Energy Minister Taner Yildiz is to run as a ruling party candidate. Is Turkey holding out for a deal? On the other hand, Kommersant's Turkish sources believe that the key issue is not politics, but gas prices for Turkey, which Gazprom is in no hurry to lower. Private importers have achieved a discount only after months of negotiations ($260 per 1,000 cubic meters since May instead of the original $374 – RBTH), while the state-owned company Botas has not yet received it. Volkan Özdemir, director of Turkey's EPPEN Institute for Energy Markets and Policies, believes that a reduction in prices for Botas is indeed Turkey’s main bargaining tool for the agreement on Turkish Stream. According to Özdemir, agreement can only be reached after the elections, as the Turkish Minister of Energy is very likely to be replaced, "which means the emergence of new people both in the ministry and in Botas," he said. Based on reports by Kommersant and Vedomosti.